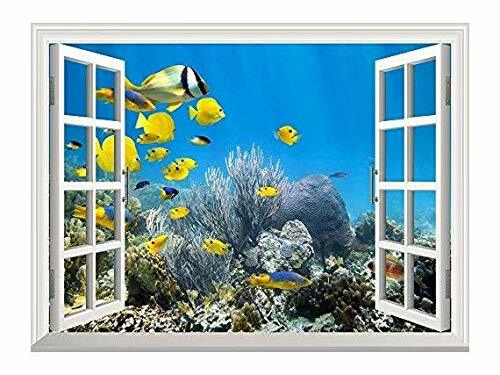 wall26 Removable Wall Sticker/Wall Mural - Underwater Coral Reef Scenery with Colorful School of Fish | Creative Window View Home Decor/Wall Decor - 24"x32"
Item arrived quickly and it is good quality. Easy to apply to wall and I am very happy with the way it looks. Thank you for a quality product and fast shipping! Go to your happy place... I’m the only person at work with a window. There is supposed to have a hurricane coming but I look out my window and the weather is nice. Quality good, thickness good. I don’t see it sticking to anything... does not come with instructions. I put mine on a backer board with scotch tape. I Placed this on a bathroom wall to give it the ultimate relaxation vibe & it has been up for over a year now; I know it is a late in the game kind of review but life gets busy.. Well it still looks perfect today. When I received it I placed it flat on my closet floor (not carpeted) with something on top to make sure it flattened it straight for easier installation, when it was time to peel & stick, it went very smoothly & I did not need another persons help. I lined it up so both left & right corners were even & then II used a folded hand towel to smooth it as I made sure no air bubbles, no creases formed. Really easy to do. I’m now moving & I removed it (reason I decided to review it), came off like a charm, no damage to wall paint. Excellent product & very lively & pretty. Bought this for my daughters room, she loved it! The wall mural was great but it didn’t arrive as scheduled! Looks great in our small lavatory room. Happy with purchase. The only drawback was in separating the backing paper from the vinyl picture. Took some effort to achieve this operation. Otherwise would have given it a five. I Love this ! everyone touches it because it looks like a real window! I put it in a room with no window. Amazing ! Highly recommend !